Oh my, how good it feels to get back into my craft room, you know, the one with the offending guest bed in it. 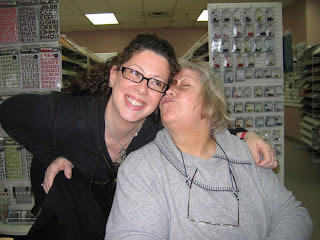 Just kidding, we love to have visitors and they really need to like sharing the room with my craft supplies. So far, it hasn't been a problem. 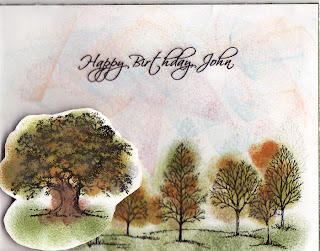 But I digress -- I really wanted to show you the card I made yesterday. When I met with The Bella, I picked up the Javabellas. I love this stamp. The background paper is a template downloaded from The Stamp Shack. As members, we can download all the templates Sherry offers on her site. It makes me feel like "one" with my friends. I have one friend in particular, Hazel, who is my BFF. She and I go waaaay back and have had a solid friendship free of quarrels. All this through the raising of our children (a mine-field for falling out with friends), a divorce (mine and she has managed to stay friends with both of the parties to that marriage), and, last but not least, living several hundred miles apart for much of the time (and they say relationships can't stand long distances). As a side bar, today is Haz's birthday, so my friend, Happy Birthday to You! Over the years we have talked at LEAST once a week on the telephone. It never fails that one of us will say, "I wish we could just get together for a coffee." When we lived near each other, and I mean literally around the corner, her house was my house and vice-versa. I remember one day one of her sons arrived at my door to say my Mother had been trying to call me but the line was busy. Upon checking it out, I found my daughters were using the computer for online chatting (we had dial-up then). Hazel has been my friend and confidante for so long that we can't possibly fall out now. She could bury me with the secrets I've told her! Anyway, I started out this post to show you my card and ended up telling you about my friend. That's okay, that's what blogs are for. I sit down and start typing and my fingers seem to be connected to my sub-conscious 'cause it's always a surprise to me what appears on the page. 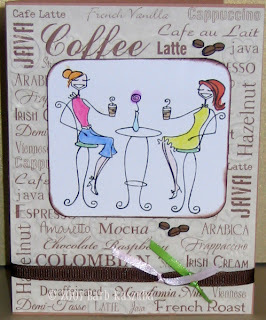 As this blog is called Barb's Card Creations & Other Stuff, today is about the 'other stuff'. As previously posted, I went to visit my children and grandsons in Toronto in mid-February. Above this post you will see a Photo Flick created through Picturetrail. Just click on any photo to see a larger version. I will leave this on for a few days because I'm so very proud of them and want to share. I had a wonderful, whirlwind visit and enjoyed just watching my grandbabies sitting on the blanket and playing with their toys. They are 7 months and 8 months and both are very active babies. I was able to feed them, change them and give them back to their mamma when the cried. Now that's what being a grandparent is all about! One night I even got to keep Owen overnight. In the middle of the night, he would wake up and babble to himself, make those beautiful little baby noises and then go back to sleep. It was a joy just to listen to him in the darkness. The week flew by all to quickly and now I'm home again. I'm going to go make some cards now and will post the best one tomorrow. See ya' all later. Okay, I promised pics and here they are. May I introduce you to Emily, The Bella, and Nicky, The Designerbella. Individually they are awesome, collectively they are a powerhouse. The first to arrive at Cherished Scrapbooks was Nicky. I guess she knew me right away because I was a "new face" at the store. Nicky walked right over to me and said, "Barb? ", I said yes and she gave me a big hug. Oh what a welcome. I just knew that this was going to be a fabulous couple of hours. Shortly after, Nicky's phone rang and it was Emily wanting to know who wanted tea or coffee. After the orders were placed, I just followed Nicky around the store intensely watching to see if I could discover the secret of how to choose papers! I finally decided to just buy what Nicky buys, no secret, just easy. I'll bet my bottom dollar (almost there) that our creations have no similarities whatsoever, other than the main image will be a Bella image. It wasn't long before this tall, dark-, long-haired, stunningly beautiful woman walked into the store. I recognized Em immediately because of her curly hair. Oh yeah, and the Tim Horton's coffee cups she was sporting, too! She just grinned from ear-to-ear and after the precious passel of goodies was deposited on the table, I got the biggest hug ever. What a delight. I was speechless and tongue-tied all at the same time. I had so many things I wanted to say and I truly felt like I was in the presence of royalty. I said, "I think I should ask for your autograph". Em's response to that was a rolling of those huge dark eyes accompanied by a long sigh and, "Oh, puleeze, I change dirty diapers all day long.". I knew then and there that this lady was wonderful. There are absolutely no pretenses with Emily. She is who she is and that's it. We chatted about so many things I can barely remember. 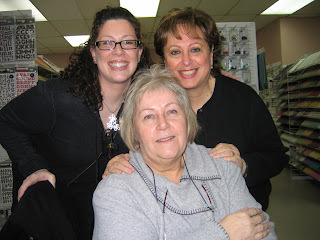 What I do know is that whenever I'm in Toronto, visiting Cherished Scrapbooks and meeting these two terrific women again will be high on my agenda for sure. Emily told me how she started selling her stamps in this very store, but can you believe I didn't ask her how long she's been doing this. She told us her son was home with a fever, we talked about the importance of reading to our children, she showed me the card she made using her new scalloped edge stamp (just ordered one, Emily), and we looked at some stamps that would be appropriate for weddings (I ordered those as well). And, as is always the case, there was some woman-talk that will not be repeated here but will remain a fond memory to me, but it was hilarious, I can tell you. We sat around chatting like old friends and that is truly how they made me feel. There was also another lady there, Anne Parretta. She has at least one card, possibly two, being published in The Rubber Stamper coming out soon. So look for her cards. Anne is a teacher of teachers and is highly committed to reading to youngsters. I believe her daughter is getting married soon, as is my son, so we had plenty in common. Anne is well known to Nicky and Em so conversation just flowed without any problems at all. I finally had to leave to go back to Guelph around 3 p.m. May I just say right here that, with the exception of just looking at my beautiful grandsons, this was THE BEST few hours of my entire week. It was something I did just for me and I left there feeling like I was walking on a cloud. Just ask my kids. When I got back to Guelph, I talked non-stop about my afternoon. I pulled up The Stamping Bella site and made them all look at the stamps and telling them, "I met the lady who designs the stamps and the lady who creates the cards with these stamps!". I'm sure my kids were happy for me, but I'm sure they were also glad when I finally said I had to go to bed and get some sleep. Well, that was my meeting with Em and Nicky. I can't wait until the next one! Editor's Note: My DH just saw this and asked me to put in this addendum: Where it says "I'll bet my bottom dollar", it should read, "I'll bet my DH's bottom dollar". Man, I'm glad he has a sense of humour. It feels so good to sleep in my own bed with my sickie husband. Poor man has contracted a cold while I was away visiting my family, grandchildren and, The Bella Herself, Emily. And, I was fortunate enough to meet Nicky also, The Designerbella. Both ladies are super fantastic and fun just to hang out with. I followed Nicky around the store, Cherished Scrapbooks and promised myself that whatever paper she chose, I would pick up also. I mean, if Nicky's going to use it, it must be fantastic stuff, right? I can't begin to tell you how excited I was to meet these ladies. I couldn't even finish a sentence before going on to something else. At one point I started to say, "only Emily" and a few minutes later Nicky says, "what do you mean, only Emily". I had to think about that for a second, then remembered that my sentence was actually a dangling participle and what I was trying to say was, "only Emily has small children and needs to be closer". You see, Cherished Scrapbooks has two stores, one in Mississauga and one in Thornhill. While Mississauga store was closer to where I was staying, the Thornhill store is Emily's LSS. Nicky, please forgive me, you are equally important to me! I also met another lady there, Ann, and she was the most awesome woman to talk to, very interesting and we had a great deal in common, I thought. We both love this craft and we talking about education and children and all kinds of stuff. What a fabulously fun afternoon. I really didn't want to leave, but neither did I want to get caught in rush-hour traffic on the highway home. I promise to post a couple of pictures later today or tomorrow. I've still not unpacked yet and I have to take a trip to the Minnesota border store to pick up my Cuttlebug which is waiting for me there. Then I have an appointment at Michaels's Arts and Crafts store which is opening up on Saturday here in Thunder Bay. I've been hired to teach cardmaking and scrapbooking there and they want a bio on me. Believe me, it will be short as I've only been stamping and cardmaking for about a year or so. So, this is me, saying see you later with more on The Bella and Designerbella! I'm at Andrew (my son)and Sheena's apartment and he and Sheena out picking up some groceries. We're having company for lunch so I can show off my grandbabies to their great uncle who hasn't seen them yet. They are so beautiful. Both boys are sitting up and almost crawling. Jack, 7 months, gets around the floor using an inch-worm motion. Pushes his chest and belly up off the floor, dives forward and clunks down on his belly. But when he sees a toy he wants, he's determined to get it, let me tell you. Owen was considerably jet-lagged after his flight from the UK. But he's beautiful, too. He is 8 months and has more of a little boy look, as opposed to baby look. He's quite serious little fellow, but then he came from a house with only Mummy and Daddy, to a house full of strangers, loud music, another baby and lots of goings on. He'll get used to it and will be an absolute joy to watch. Thankfully, neither of the babies made strange with Grandma. That would have broken my heart, but all I got was smiles all around and lots of cuddles. More cuddles coming today. I'm having just the bestest ever time with my family. I'll post pictures in a couple of days. I can't wait to show you! Well, I'm off to pack my suitcase now for my trip tomorrow. If I don't get a chance to post anything for the next week, when I get back I'll have a ton of stuff to write about. Have a good week, all, and Happy Valentine's Day! I Got the Music, the Music's In Me! I love 50's music. 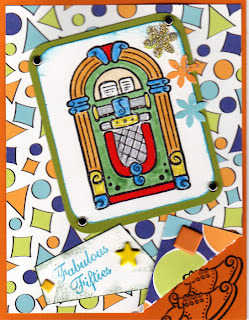 I was listening to the American Graffiti CD while making this card. This stamp is from Pink Cat Studio. They have amazing stamps and I'm planning on getting more very soon. I'm off to Toronto next week. My daughter, Kirsten, is coming in from England with her son, Owen. Unfortunately her husband, John, will be staying home as he's saving his vacation time for the summer. My youngest son, Phil and his partner, Kristyn, also have a baby, Jackson, and so me, Grandma, is going to have lots of cuddles and babysitting time! I can hardly wait. In fact, all of my children live in the Toronto area; my eldest daughter, Tiffany, will be celebrating her birthday next week and my son, Andrew and his girlfriend Sheena, will have the absolute pleasure of hosting me while I'm there. It seems everybody is taking time off work to enjoy some quality family time together. I would like to think it's because Mom is coming to town, but I really know it's because Kirsten & Owen will be here. My daughters have the strongest bond between sisters I have ever seen. Of course, they are only 11 months apart, and have shared a room until they were well into adulthood. The boys arrived much later and I'm sure it feels like they have three mothers, me and their sisters. I'm very proud to say that all the siblings are close to one another. I think that is so important and I hope it continues forever. I hope to visit some scrapbook and stamp stores next week. I'm even hoping to meet Emily, of Stamping Bella fame, while I'm in Toronto. One of my strong desires is to visit The Cherished Scrapbook, both in Mississauga and Thornhill. One can't get enough of scrapbook stores and Toronto has an absolute plethora of such facilities as compared to Thunder Bay. We also have other family members and friends to visit. My own sister, Shirley, my brother Bob, BFF Hazel.....so many people to see and so little time. I'm just looking forward to seeing my grandsons again. The last time I saw them they were just 5 weeks and 12 weeks old. Now they are 7 months and 8 months and, according to all accounts, both are sitting up, smiling and laughing out loud, very sociable and if they "make strange" with Grandma, I will be devastated. I haven't bought them anything yet because I want to see their size for myself, but I do intend to buy presents for them. After all, what is a Grandma for, if not to spoil them with gifts. It's just really hard to do that when I am so far away. Plus, I have great plans for when they are a little older. Because walking is difficult for me, when they visit Grandma's house, we going to spend quality time stamping cards and stuff! I will nurture their creativity in any way I can. Well, that's it for now. Enjoy today and be happy! Did you know I have a mouse phobia? Well, it's true. When the kids were little, if there was a mouse in the house, I was always able to control my reaction to it. I wouldn't scream or jump up on a chair or anything like that. I knew that I had to not frighten my children, so I kept a lid on it. Then, one day, when I was alone in the house, it happened! Yes, it did. I was walking into the living room when right over there, in the dining room, was a brown, furry, HUGE, and I mean at least 6 feet tall (think Jimmy Stewart in Harvey), critter. I stopped dead in my tracks and watched in horror as that THING scurried across the floor and under the dining room cabinet. I stood there, gaping, for at least 15 seconds. I finally made it to a chair and curled up in the fetal position. I remember it being about 2 minutes before 9:00a.m. because I called John, my husband, at work, praying that he would answer the phone. He's a teacher you see, and class started at 9:00. Thankfully he answered the phone and all I could do was whisper, "There's a mouse in the house, please come home." He could hear the distress in my voice and left the class to come home. What he found when he arrived scared the living daylights out of him. He says my eyes were glassy, I was screaming and wailing and he was afraid I would have a heart attack. That poor man had to take two days off work and take me to the doctor to get a prescription. I don't remember what was prescribed, only that if I saw another mouse I was to place a tablet under my tongue, let it dissolve and it would wipe out my short term memory! My God, I am a grown woman, much bigger than a mouse, but there you go. Why do I tell you this, you might ask. 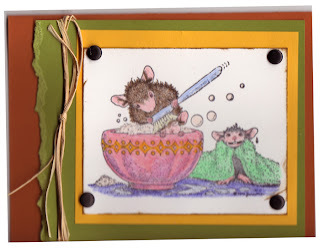 Well, if you look at the card with this post, you will see it is a House Mouse stamp. 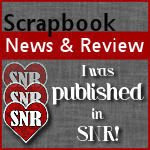 I am living proof that stamping, cardmaking and scrapbooking can change your life! Here it is, a scant two years after that incident and I'm colouring the little buggers! No meds required! Well, I've said enough for today. Thanks for dropping by. I'll be back again, soon.